Today I have another post for you that is from my quest to complete projects that have been on my to-do list for a really long time. I recently made wool dryer balls. It has been over a year that I have been wanting to make wool dryer balls. Yay for another thing off my to-do list! Of course I've got you covered as well. 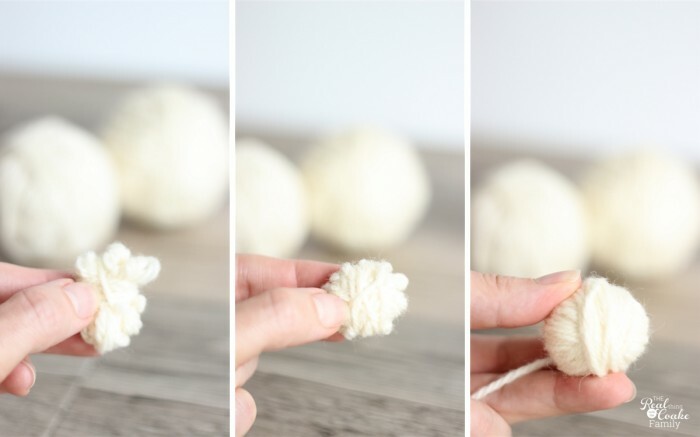 I've got a full tutorial so you can make your own wool dryer balls. 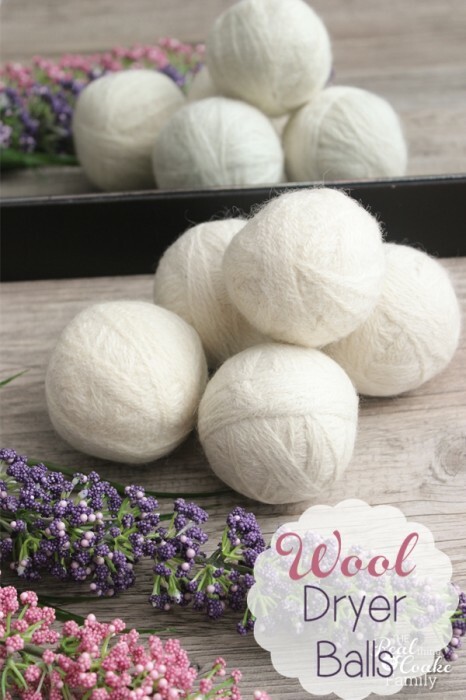 First, let me tell you a little bit about wool dryer balls and why you might want some as well. Wool dryer balls are supposed to reduce your drying time. Saving you money by saving energy. They are said to reduce drying time by up to 50%. They will eliminate static, eliminating the need for dryer sheets or sprays with chemicals or perfumes. You can also eliminate the cost of buying those sheets and sprays. They will often help soften your clothes and reduce wrinkles naturally. 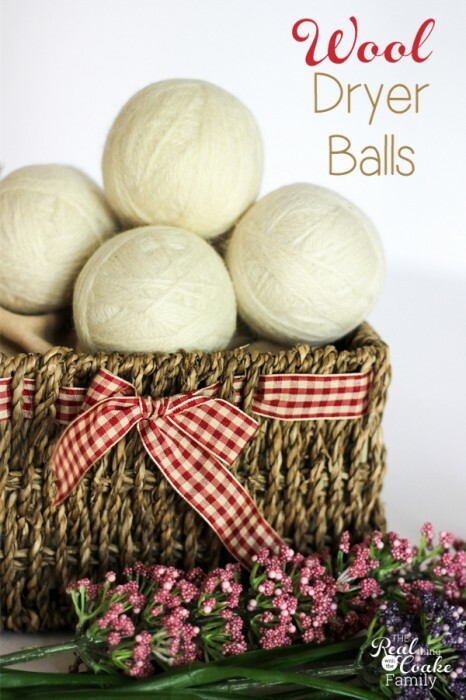 By using wool dryer balls, you are doing one easy thing to help the earth in multiple ways. Sounds good, right? 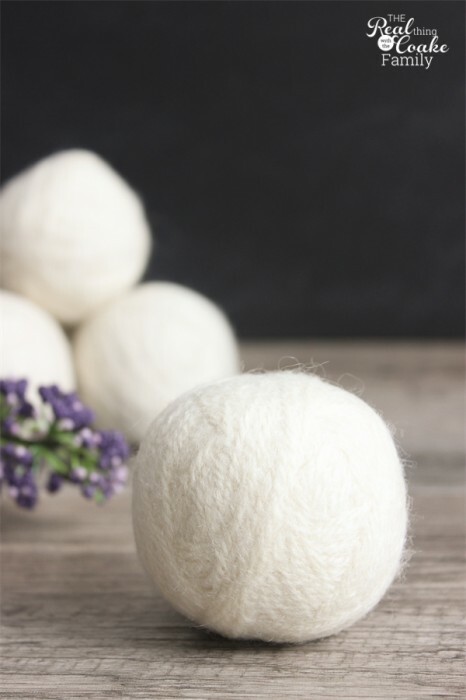 (affiliate link) to your wool dryer balls to add a natural fragrance to your clothing, sheets and towels. That way you don't have to sacrifice fragrance if that is really important to you. Make sure if you add essential oils that they are good quality, 100% pure oils or they may stain your dryer balls. (affiliate link) – Do not get any yarn that says it is washable. Make sure it is 100% Wool. 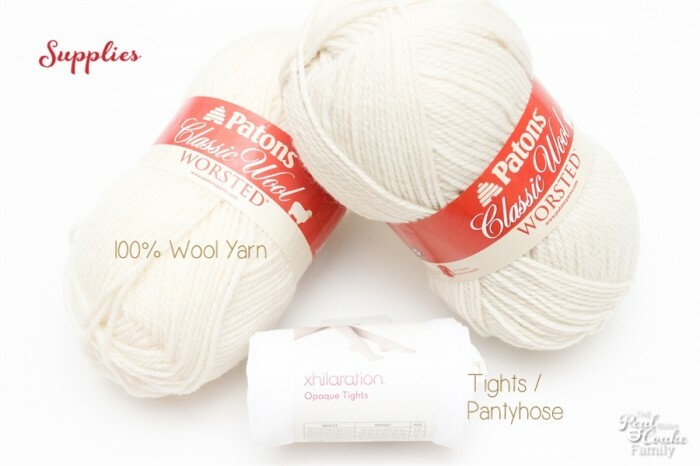 Start with your 100% wool yarn. 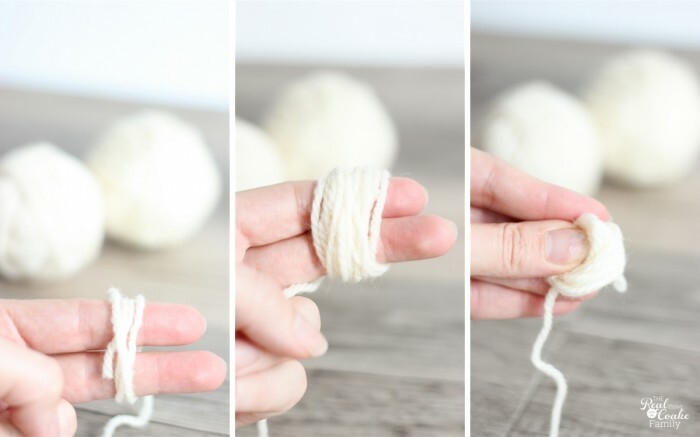 Wrap the yarn around your fingers until you have a small bunch. Pull the bunch off your fingers and pinch it together in the middle. Start wrapping yarn around your pinched together bundle. Trying to go completely around your bunch. As you wind, a ball will begin to form. This is a fantastic project to do while watching TV. It is not hard in the slightest, but it will take some time to wind 5 to 6 dryer balls. You will want 5 to 6 total. 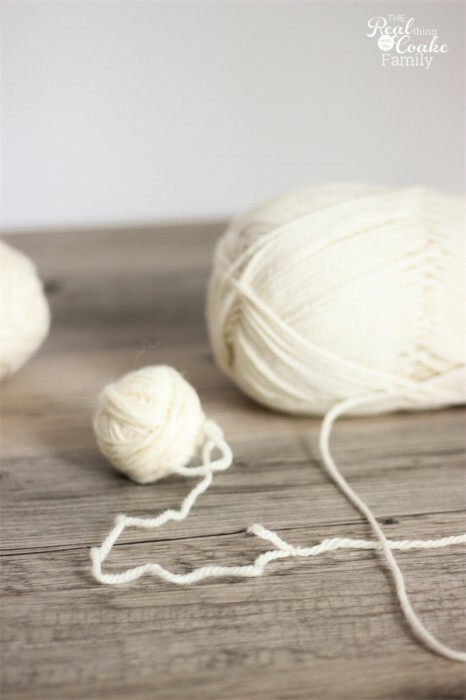 If you are midway through winding a ball when you run out of yarn, just tie a knot with the first yarn to the second skein of yarn and keep winding. Make your dryer balls about the size of a baseball. They can be slightly larger or slightly smaller. No need to be a perfectionist with this. With my two skeins of yarn, I was able to make 5 wool dryer balls. When you have a dryer ball the size you want, clip your yarn. 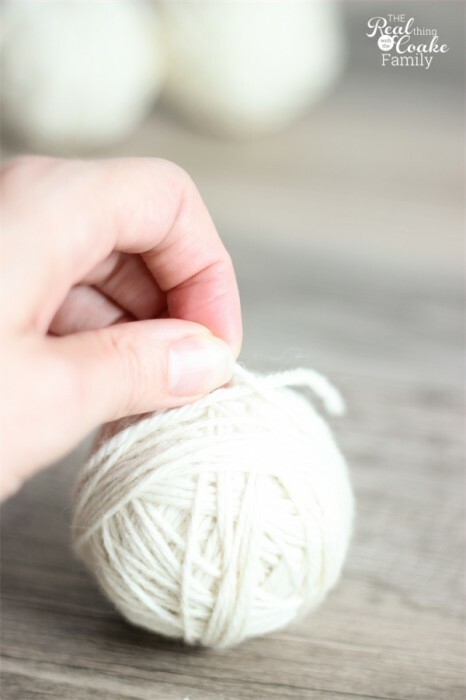 Tuck the yarn under a piece of yarn that is wound tightly in the ball. Twist that piece of yarn in and out of other tightly woven pieces of yarn. Finally tuck the end completely under. Your dryer balls should look something like this. Place the dryer balls into the leg of your old pair of tights or pantyhose. 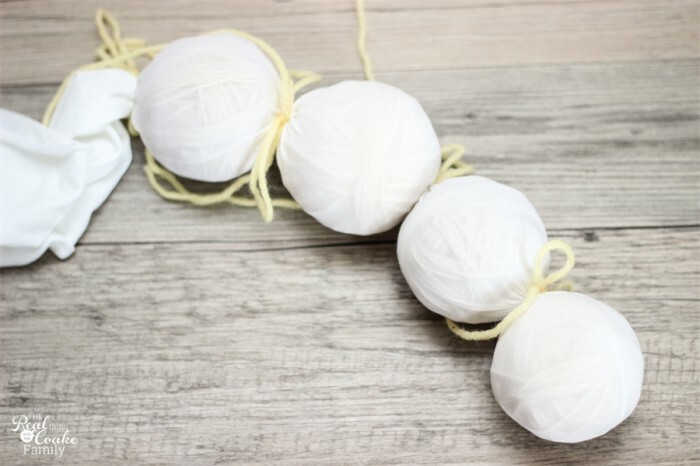 Tie each ball off with twine or yarn. Make sure that this yarn is not 100% wool. If you use 100% wool yarn here, you will felt it as well and won't be able to get your balls out without cutting them out of the pantyhose. Wash your wool dryer ball snake 4 to 5 times in your hottest water cycle and dry them on your hottest dryer setting 4 to 5 times as well. I did this while doing normal sheets and towels laundry so as to not waste water. It worked perfectly. After washing and drying 4 to 5 times, you have now felted your wool dryer ball. Can you see the difference? With the felted dryer ball there are not the distinct marks of the yarn wound around, it is more flat and smashed together. Place 2 to 3 dryer balls in your dryer per load. I made my dryer balls just a few days before we left on our cross-country trip. Thus far I am loving them. I did notice that a couple of my loads took a lot less time to dry then they would have in the past. I have not noticed any static when using the dryer balls. Then we left and I haven't been able to use them more. (affiliate link) when we get back. I think that will be really nice. I plan to use different oils during different seasons. Oils that will help ward off mosquitos during the summer and oils that help keep us healthy during the winter. Doesn't that sound fantastic? Can't wait! Hey, do you follow me on Facebook, Instagram, or Pinterest? If not, why not? You are totally missing out on more fun ideas and cuteness. Have you ever heard of wool dryer balls before? Any other benefits you have noticed if you currently use them? I will try to remember to do that. I’m pretty sure I’m still going to be loving them. It will be interesting to see how long they last for and when I need to make new wool dryer balls. I have never heard of these before! What a neat idea. Thanks for linking them up to Inspire Me Monday! Pinning them today! Thanks for this tutorial. I actually bought some dryer balls on amazon a few months ago, but I think I have already lost one. I love the idea of adding essential oil to them too. I need to find one that both me and my hubby will like. I love dryer balls but have not made any yet. I buy them on Etsy and always give them as baby shower gifts. The dryer sheets are seriously bad for us because we essentially rub chemicals on ourselves when using towels dried with dryer sheets. But static-free and softness are important and so I give new moms wool dryer balls. I find the best ones are Austalian virgin wool. My daughter loves them as she lives in a cold climate and it does decrease drying time quite a bit. I SSTILL have to buy some for myself! So maybe I’ll make some! Sounds like a great baby shower gift! I never really thought about all the chemicals in them until the last year or two. I’m slowly greening myself over the last 10-11 years. You definitely should make some for yourself. A gift for you! I have never heard of wool dryer balls. Interesting! I’ve heard of tennis balls for fluffing and a ball of aluminium foil for static, but not wool balls. I will have to give these a try! Thanks! Yes, they are great! I am really glad I finally got around to making some. Hope you love them if you give them a try. I’ve been doing this for years. I can’t imagine the amount of money I’ve saved on dryer sheets, not to mention keeping the chemicals out of our lives. I did it exactly as you did..and yes I do use essential oils. I also have been making my own laundry soap..another huge savings and you know what’s in it. I’m so glad to hear that it has saved you money! I was assuming that it would, but I am glad to hear that it will from someone who has been using them. I’ve been making my own laundry soap for years as well(there is even a blog post here with my ‘recipe’). You are right it is a huge savings! Love that! and I love knowing exactly what is in my detergent. I don’t usually use hot water to wash with, have you thought of boiling the balls? I purchased my wool yarn yesterday and started my first ball last night. I don’t know if you can boil them or not. I would do a quick Google search and see if that is a felting method. I know a friend of my said she had a felting tool. She was thinking of making them and said she was going to try the felting tool. You just need to felt the wool balls, so search for a wool felting method that works for you. I’d love it if you let me know what you try and how it works for you. 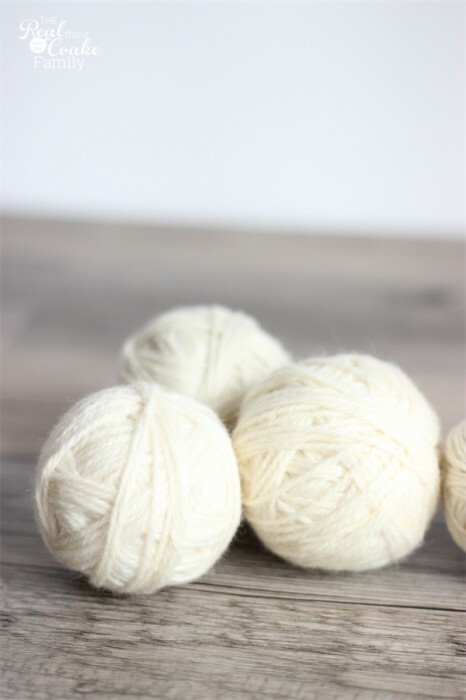 i am making my wool dryer balls right now! went to a yard sell, got 3 skeins of pure wool for $2. woohoo. going to go back tomorrow and see if anymore wool yarn is left and make somemore. Hi! I use wool dryer balls everywhere I do laundry (I clean rental properties ever since I retired) and they do work great for reducing time and energy. I only add the oils to my own laundry though. I use white wool but do you think other colors would be OK too…I have lots of wool from felting projects that needs to be used up! I can’t see why it would make any difference to use colors but there may be a reason I don’t know about? I wish I had a great answer for you, but I really don’t know if other colors would be OK or not. I’m sure they would be fine if you are doing dark colored laundry, but for lighter colors, I wouldn’t take a chance. If you give it a try, let me know what happens. I’d love to know. I just made some tonight for the 1st time. Can’t wait to start using them. Do you add a couple of drops of oil to the ball for every load, or does the smell on the balls last a while?